Family Circle Magazine’s Presidential Cookie Bake-Off, which traditionally pits the cookie recipe of the current First Lady against that of the First Lady Hopeful, first occurred in 1992 and has now spanned six elections. What began as PR damage control for Hillary Clinton before the 1992 election (after she was accused of being out of touch with stay-at-home, cookie-baking women), has, oddly, become a rather prophetic indicator of the likely outcome of presidential elections. With the exception of Cindy McCain, every winner of the bake-off has gone on to the White House. Not only does the outcome of the contest itself seem to (sometimes) predict that of the election, but one may even be able to predict the outcome of the bake-off itself based on one little factor: whether either recipe contains oats. According to Slate.com, trend analysis of the bake-off’s previous winning recipes has revealed that oat-containing recipes have consistently beat-out their non-oat-containing counterparts. From Cindy McCain’s oatmeal-butterscotch cookies to Laura Bush’s oatmeal chocolate chunks, this continues to ring true. So, if A+B=C, then do oats win presidential elections? But cookie batter isn’t the only thing this contest stirs up – it also yields plenty of controversy. Many feel that the contest is outdated (and has been since its inception), and that it reduces some of the most politically powerful and influential women in the country to recipe-swapping, 1950s stereotypes. The flip side of that, of course, is that if the contest were to be canceled, it could be seen as a slap in the face to women who choose to work in the home and/or might imply that women who do have careers don’t also make time for their families. It’s pretty treacherous ground any way you slice it. So, sexism and sugar aside, Will Ann Romney‘s oat-containing M&M recipe beat outMichele Obama‘s white and dark chocolate chip recipe? If it does, will Mrs. Obama pull a second upset and land in the White House anyway? Only time and voters (of both the bake-off and election varieties) will tell. 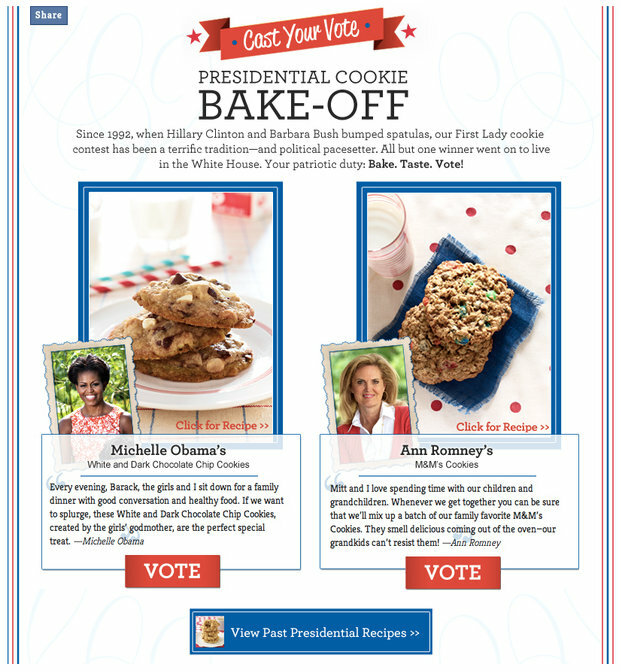 If you are interested in whipping up a batch of presidential cookies, or want to vote, click here. Posted on August 15, 2012, in So Random! and tagged Ann Rommney, family circle magazine, government, Michelle Obama, politics, Presidential Cookie Bake-Off, Presidential Election 2012, so random, United States of America, White House. Bookmark the permalink. 1 Comment. Way to go First Ladies.